SEOUL -- With mobile technologies maturing rapidly, foldable displays are the beginning of a "sea change" in the smartphone form factor, a senior researcher at Samsung's mobile communications division said, predicting technological innovation will make smartphones more central to everyday life than ever before. Foldable screens demanded a total reconfiguration of smartphones from inside out, with the battery, cooling system and camera being placed inside a slim body efficiently, Kim Hark-sang, who heads the visual R&D team at Samsung's mobile communications business, said in an article posted Samsung's website. 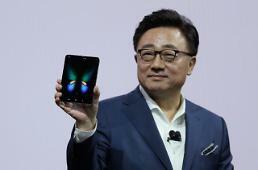 "We expect to see a sea change in the smartphone form factor in the coming years. From rollable and stretchable devices to the devices that can fold in multiple ways are no longer beyond the realms of reality," he said. Kim aid smartphone displays can't get any larger without compromising portability. "Instead of accepting the status quo, resolving the contradiction between screen size and portability and developing a new form factor became the central focus of our innovation efforts." "Whether it’s leveraging increased connectivity or harnessing next-generation mobile intelligence, a larger display will be key to accessing future smartphone experiences," he said, referring to a thin AMOLED display called “Infinity Flex” that can be folded multiple times. 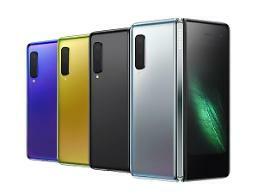 The prototype of Samsung's foldable phone was shown to selected guests at the Consumer Electronics Show (CES) in Las Vegas. SK Telecom CEO Park Jung-ho acclaimed Samsung's foldable smartphone as a wonderful device suitable for media and content in the era of 5G mobile communication. Samsung has said the upcoming foldable smartphone would fold inward with its 7.4-inch screen being reduced to 4.6-inch.